A year ago, Gabi Lewis and Greg Sewitz sold their company Exo, which makes high-protein bars with powdered crickets, to Aspire, another player in the cricket biz. (The price was not disclosed). Today, April 9, the two former Forbes 30 Under 30, who started whipping up their first crickets bars at Brown University and are now both 28, are launching their next act. News flash: it has absolutely nothing to do with bugs. 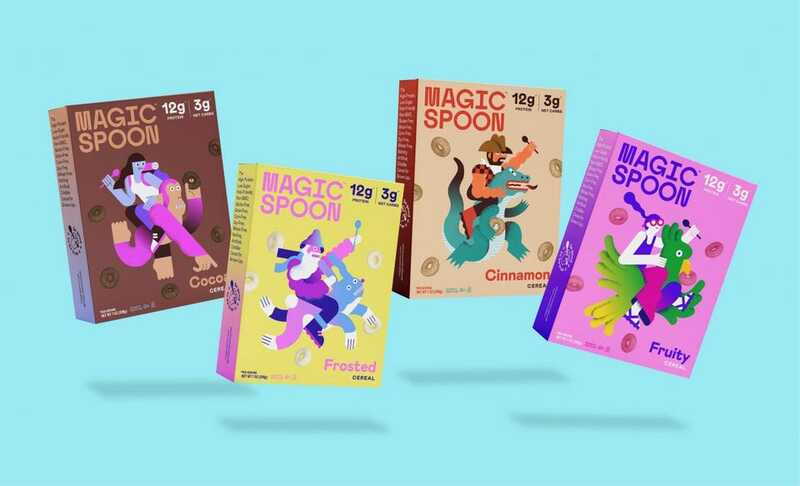 The cofounders are now officially cereal (and serial) entrepreneurs with the launch of their new brand, Magic Spoon. Lewis and Sewitz, whom I first wrote about in 2015, are making a foray into the $10 billion U.S. cereal market by riffing on classic childhood favorites and updating their nutritional profile. Their cereals are grain-free, low-carb and high protein. made with a trio of low-calorie, natural sweeteners. (There are just 3 grams of sugar in a serving, 110 calories and 12 grams of protein.) To start, there are four flavors: cinnamon, cocoa, fruity and frosted. The packaging is colorful and whimsical. The company will initially offer a $35 monthly subscription for four boxes. (A single month’s supply costs $39.) In the next three to five years, they hope to break into supermarkets, where 96% of U.S. consumers buy at least one box of cereal during a shopping trip. The startup has raised a small seed round from investors including New York-based Collaborative Fund and Los Angeles-based Wild Ventures. I caught up with Gabi and Greg pre-launch by telephone. Our conversation has been edited for length and clarity. Schatz: Why cereal and why now? Lewis: Greg and I always loved cereal, having it every day for breakfast. Then we got to a certain age and stopped eating it because it’s pretty terrible for you. Sewitz: Coming off of Exo where there was a huge educational component and we were really starting from a small niche space, we wanted to give ourselves the opposite challenge the second time around and choose a category that is ultra-mainstream but that hadn’t seen a lot of innovation in a long time. It seemed like a really fun challenge to update cereal for consumers like myself and Gabi. Schatz: How important is nostalgia to your marketing? Sewitz: The overall idea of the brand is to really evoke that Saturday morning cartoon nostalgia that all of our target customers feel. We really wanted to walk the line of nodding to those classic cereals and the flavor and the design and the branding but have the product be 21st century. We did want to evoke the classic animal mascots of children’s cereals but update it a little bit. We wanted the whole thing to be fun and really remind people why they started eating cereal in the first place. Lewis: Eating oats and eggs are a lot less fun than a bowl of colorful cereal. Schatz: Who is your target audience–Millennials who secretly eat Fruit Loops for dinner? Sewitz: You want to build a company for yourself in some ways. Definitely part of our audience is Millennials like Gabi and I, who grew up eating cereal but are smarter now about our bodies. There are also a lot of people who eat a bowl of yogurt in the morning or overnight oats and might be more than willing to switch to something that’s more convenient. And the last target we’re thinking about are Moms and Dads, who are really trying to find something that is healthy to give to their kids and their kids are excited about eating. Schatz: How did you arrive at your blend of ingredients? Lewis: It’s a pretty hard technical challenge to create a cereal with protein and no grains. It took us about a year and hundreds of different formulations. Lots of consumers these days are avoiding grains and more generally trying to keep their carbohydrate intake lower and make their protein intake higher. We use lactose-free protein isolates. Whey protein isolates are the gold standard in protein quality. In terms of bioavailability and the quality of the protein, it beats all others. We created a custom blend of three different natural sweeteners: stevia, monk fruit and allulose. which is found in nature in maple syrup and figs. What did you learn from starting Exo that’s helping you this time around? Sewitz: One of the lessons we learned from our last business was to always iterate on the product, so it’s never done in our eyes. We think it’s pretty close to the cereal we remember, but we will always keep improving it. Lewis: Even though it’s five, six years later and we’re obviously using a lot more food scientists this time around, it’s remarkable how similar the very early first steps of product development were at Magic Spoon as compared to Exo. At Exo, we were making little samples in our dorm of the first-ever cricket bars. And this time around, we were making various samples in our kitchen in Brooklyn and sending them out for feedback. Schatz: Did you ever think about using crickets in your cereal? Sewitz: We really didn’t want limit ourselves in any way, in terms of getting ourselves in front of as many cereal eaters as possible. Schatz: What did it feel like to sell Exo last year? Lewis: It was bittersweet, of course, as it always is for founders. We were doing cricket protein at a time when no one was doing it. We grew our baby over five years and had some amazing success and a lot of fun along the way. We’re also super excited about this new challenge.